After more than 30 years, the Terminator franchise continued to chug along with the fifth film in the series: 2015’s Terminator Genisys. In the year 2029, humans led by John Connor (Jason Clarke) fight against a powerful artificial intelligence called Skynet. During that period, the humans learn Skynet will try to alter the past. Connor sends Kyle Reese (Jai Courtney) back to 1984 to protect John’s mother Sarah (Emilia Clarke) from an attack by a cyborg called a “Terminator”. In this chronology, the resistance sent its own terminator (Arnold Schwarzenegger) to defend Sarah in 1973, and she still uses him for protection in 1984. We follow their relationship as well as the altered connection between Kyle and Sarah and related concerns as those involved continue to fight against potential Armageddon. It’s also fun to see Schwarzenegger back as the Terminator. 31 years after the first movie, this remains his defining role as an actor, and he continues to do well in the part. While I think the story stretches credulity to allow the 67-year-old Schwarzenegger to play a presumably ageless character, I don’t really care. Schwarzenegger brings what he needs to the role and adds credibility to the proceedings. Otherwise, Genisys offers a mixed bag – a statement I could assign to all of the movies after 1991’s Terminator 2. I think that one remains the best of the series, and it looks better and better compared to its flawed sequels. Actually, I mostly liked 2003’s Terminator 3, though I admit it may not hold up terribly well 15 years down the road. When I saw it in 2003, I think I felt so relieved that it wasn’t bad that I may have overpraised it. While it’s an enjoyable movie, it’s not nearly as good as the first two. I can’t say I’m entirely wild about the new cast, either, though Courtney does better than expected as Kyle. He’s no Michael Biehn, but he acquits himself pretty nicely and gives Kyle good dimensionality. I’m also happy to see the always-enjoyable JK Simmons as an old-time police detective. He brings charm to his underwritten role and adds some heart to an often chilly film. Emilia can’t deliver the tough-as-nails vibe Linda Hamilton brought in T2 - and she doesn’t even come close. Emilia always feels like a little girl playing tough. She offers an impersonation of a cartoon version of a battle-hardened Sarah, one with little heart or personality. That leaves a hole in the film. 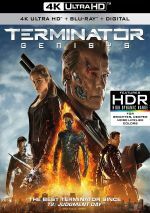 Terminator Genisys appears in an aspect ratio of approximately 2.40:1 on this 4K UHD Disc. This was a pretty good presentation. Sharpness was consistently positive. While I couldn’t claim every shot looked super-tight because some interiors lacked great delineation, I also couldn’t identify any obvious soft spots. This left the film as accurate and concise. Neither shimmering nor jaggies emerged, and the image lacked edge haloes. Print flaws also failed to materialize. The film’s palette leaned teal, but the movie also incorporated magentas and yellows. These demonstrated good clarity within design parameters, and the 4K UHD’s HDR abilities added a boost to their impact. Blacks showed nice depth, and shadows were fine, with an accurate sense of the low-light elements. This disc brought us an appealing transfer. I felt even more satisfied with the active Dolby Atmos soundtrack of Genisys. Because I don’t have an Atmos-equipped speaker system, this played back as a Dolby TrueHD 7.1 mix, and it gave us an exciting presentation. One expects a lot of action from a Terminator film, and Genisys delivered. From beginning to end, the story came with plenty of chances for information from all the channels, and the mix made fine use of those moments. The elements blended together well and provided dynamic audio all around the room in a way that combined to pack a good punch and place the viewer inside the action. Audio quality worked well. Music was rich and dynamic, while speech seemed concise and distinctive. Effects added power, as those elements appeared accurate and involving, with clean highs and deep lows. The soundtrack became a strong part of the experience. How did the 4K UHD compare to the Blu-ray version? Audio appeared identical, as both discs offered the same Dolby Atmos mix. The 4K UHD brought a moderate improvement in terms of visuals, though, as it seemed better defined. It also delivered superior blacks and contrast, and the 4K’s HDR colors showed stronger range and impact. I didn’t think the 4K offered a tremendous upgrade over the BD, but it acted as a step up in quality. Note that a 3D version of Genisys also exists, and I prefer the 4K to it. The 3D took a hit in terms of visuals compared to the standard Blu-ray, and the 3D elements didn’t add enough to the proceedings to make it worth the loss of quality. I occasionally prefer 3D renditions to 4K, but in this case, the 4K becomes the way to go. No extras appear on the 4K disc itself, but the included Blu-ray copy delivered the same materials as the original release – and some new ones as well. On Blu-ray One, three featurettes appear, and we start with the 15-minute, 51-second Family Dynamics. It offers comments from producers Dana Goldberg and David Ellison, director Alan Taylor, writers/executive producers Laeta Kalogridis and Patrick Lussier, and actors Jason Clarke, Emilia Clarke, Matthew Smith, JK Simmons, Jai Courtney, Arnold Schwarzenegger, and Byung-Hun Lee. They discuss cast, characters and performances. A few decent notes result, but much of the content veers toward fluffy praise. Next comes Infiltration and Termination. In this 25-minute, 29-second show, we hear from Taylor, Goldberg, Ellison, Schwarzenegger, Lee, Emilia Clarke, Kalogridis, Lussier, Jason Clarke, Courtney, Simmons, Smith, cinematographer Kramer Morganthau, and production designer Neil Spisak. The program covers sets/locations, stunts and action, allusions to earlier films and story/character domains, cast/performances, and Taylor’s impact on the production. “Infiltration” offers more substance than “Dynamics”, but it still lacks much heft. That leaves it as a decent but thin overview. Finally, we find the 15-minute, seven-second Upgrades: VFX of Terminator Genisys. It gives us notes from Ellison, Goldberg, Taylor, MPC VFX supervisor Sheldon Stopsack, Double Negative VFX supervisor Pete Bebb, lead CG artists Andrew Williamson and Jamie Haydock, sequence supervisors Isaac Layish, David Lee and Maxx Leong, CG artists Gerald Blaise and Tobias Keip, and filmmaker James Cameron. As expected, “Upgrades” concentrates on the visual effects used in Genisys. It delivers a perfunctory but informative view of the material. 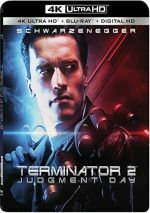 On Blu-ray Two, new extras pop up, and these start with a collection of eight featurettes under the banner of Reset the Future: Constructing Terminator Genisys. With a total running time of two hours, 20 minutes, five seconds, we find “Paradigm Shift” (15:24), “Family Dynamics” (15:51), “Old. Not Obsolete” (15:38), “Tactical Apparel” (11:43), “A Once and Future War” (16:00), “Infiltration and Termination” (25:29), “Manipulating Matter” (30:00) and “Exiles in Time” (10:16). Across these, we get notes from Taylor, Kalogridis, Lussier, Jason Clarke, Emilia Clarke, Smith, Simmons, Courtney, Schwarzenegger, Lee, Morganthau, Spisak, Ellison, Goldberg, Cameron, Stopsack, Bebb, Haydock, Leong, Williamson, Blaise, Keip, Layish, Lee, “director of photography Kramer Morgenthau, live action effects and design supervisor John Rosengrant, lead artists Jason Matthews, David Merritt, Jamie Grove and Greg Smith, lead mechanical Peter Clarke, systems manager Jason Lopes, lead on-set supervisor Mike Manzel, lead technicians Laura Palazzolo, Cory Czekaj, AJ Venuto and Steven Adkins, costume designer Susan Matheson, stunt coordinator John Stoneham Jr., property master Diana Burton, weapon master Harry Lu, compositing supervisor Robin Beard, sequence supervisor Philip Johnson and Raphael Hamm, lead CG artist Daniel Georgiou, executive music producer Hans Zimmer and composer Lorne Balfe. Through these pieces, we learn about cast, story/characters and performances, sets/locations, stunts and action, allusions to earlier films, cinematography and visual design, various effects, costumes, editing, music, and general thoughts about the project. Observant readers will notice that Blu-ray Two repeats two of Blu-ray One’s featurettes – and “Manipulating Matter” renders Blu—ray One’s “Upgrades” redundant as well. Why does the set duplicate these elements? I don’t know. I suspect that Paramount originally intended to put out a two-Blu-ray set in 2015 but they bailed on that after the film underperformed at the box office, but that’s just a guess. Anyway, as a whole package, “Reset” works well. Inevitably, various segments seem up and down, as some fare better than others, but taken in its entirety, the compilation brings us a lot of good information about the production. Blu-ray Two also includes a Multi-Angle Scene Breakdown for “Battle on the Bridge”. It offers three options: “Previsualization”, “On the Set” and “Previsualization/Final Film Composite”. Viewed via “Play All”, these go for 10 minutes, five seconds. “On the Set” acts more as a traditional featurette than a “comparison”, though, as it comes with comments from Morgenthau, Taylor, Stoneham, Spisak, Ellison, Goldberg, Schwarzenegger, and Emilia Clarke. The “Breakdown” offers a nice look at stages of the scene’s creation. For the fifth entry in the series, Terminator Genisys delivers a watchable but erratic film. Though parts of it work pretty well, the package as a whole seems inconsistent and underwhelms. The 4K UHD offers excellent audio along with largely good picture and a fairly informative package of bonus materials. Genisys brings us a sporadically entertaining but not top-notch Terminator adventure.